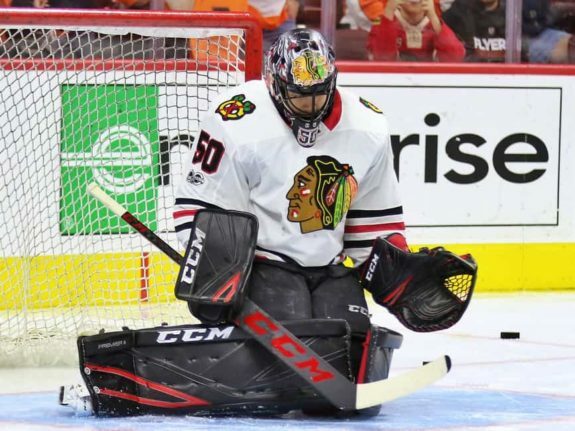 Chicago Blackhawks | Who Will Be Corey Crawford's Replacement? Who Will Be Corey Crawford’s Replacement? The mysterious injury of Chicago Blackhawks goaltender Corey Crawford has plagued his team for much of the season, and recently, fans were informed that this injury may extend far beyond this season. As many fans know, Blackhawks coach Joel Quenneville is often cryptic in his dialogue with the media. What he says isn’t often what he directly means, and the media refers to this debacle as “Q-Speak.” This is so relevant in Blackhawks fandom that Chris Hine of the Chicago Tribune put together a guide entailing Quenneville’s most common sayings and what they actually mean. When Quenneville is direct and straightforward about something, you know it’s serious. Throughout the length of this injury, Quenneville has remained confident that Crawford will return at some point this season. Until recently, that is. When asked if Corey Crawford’s injury was career-threatening, Quenneville responded by saying “Not sure about that. Too far out (to tell),” according to Paul Skrbina of the Chicago Tribune. Now that it’s at least a possibility that this injury could end Crawford’s career, it might be time to check in and statistically analyze the current Blackhawks goalie prospects. Since Anton Forsberg has seen extended time in the NHL and both Jeff Glass and J.F. Berube aren’t really prospects, let’s avoid them and instead go into unknown territory. After you see this, you might feel differently about the moves that the Blackhawks need to make this summer. In July of 2017, the Blackhawks agreed to a two-year contract with netminder Collin Delia. The 23-year-old goaltender has split time between the Indy Fuel of the ECHL and the Rockford Ice Hogs of the AHL this season. Delia has struggled mightily in his 10 games so far this season with the Indy Fuel, posting a 1-7-2 record. This is good for a 4.12 GAA and a .887 save percentage. Not too promising. Surprisingly, he played better in his games up with Rockford. In 15 games this season with the Ice Hogs he has posted a 7-6-2 record. His GAA is 3.06 and his save percentage is .890. It’s encouraging that Delia takes advantage of promotions and excels at a higher level, but he is still far from being NHL ready. Before his time in the ECHL/AHL, he spent three years playing in the NCAA for Merrimack College, where he appeared in 56 games. His best GAA was 1.86, and that was posted in the 2014-15 season. His best save percentage with Merrimack was .937, and that came in the same year. Overall, his GAA with Merrimack was 2.32 and his save percentage was .918. 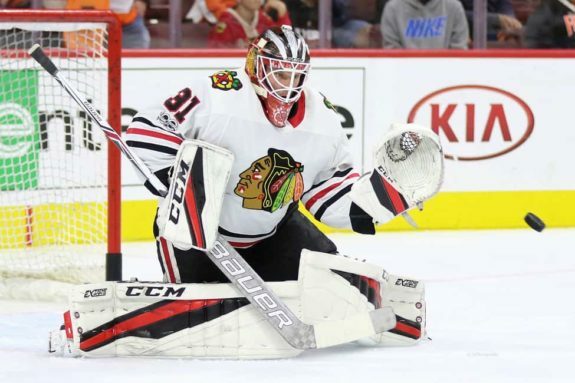 Ivan Nalimov, a 23-year-old goaltender who has spent his entire playing career overseas, seems to be the guy that many Blackhawks fans are pointing towards for the future. Maybe the calling for Nalimov is warranted, as he has had a lot of success in the KHL, but skill doesn’t always translate straight to the NHL. Nalimov’s first big accomplishment came in the 2012-13 season when he had the highest save percentage in the entire MHL, at .931. The MHL is better known as the Maritime Junior A Hockey League, and Nalimov was a member of SKA-1946 St. Petersburg. During this season he also played four games for the Russia U20 team that received a bronze medal at the World Junior Championships. 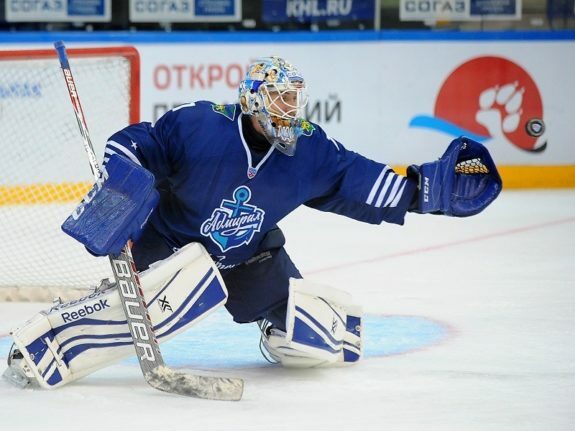 Nalimov also took the KHL by a storm in the 2014-15 season as a rookie playing for SKA St. Petersburg. That season he was named rookie of the month once as well as rookie of the week three times. You’d have to think the Blackhawks would like to get him skating on North American ice sooner than later, whether it be for the Fuel or for the Ice Hogs. If his game indeed does translate from the KHL to the NHL, you could see him in the NHL a few years from now. Matt Tomkins has taken a developmental path very similar to that of Delia, spending a few years in the NCAA and then splitting time between the Ice Hogs and the Fuel this season. Tomkins spent his NCAA career playing for Ohio State for four seasons. He played 67 total games for Ohio State, posting an overall GAA of 3.10 and an overall save percentage of 0.896. His best single-season GAA was 2.48, when he started 22 times in his final season with the club. This season is his first season in the ECHL and AHL, and he has split time between both. In seven games with the Ice Hogs in the AHL, he has an atrocious 4.03 GAA along with a save percentage of .869. Down in the ECHL with Indy, Tomkins has a GAA of 2.63 and a save percentage of .935. Not only are his numbers solid in the ECHL, but he has become a pretty good fighter too, getting in a fight with an opposing goalie in late 2017. It’s safe to say that Tomkins isn’t ready for the AHL quite yet, so it will likely be a long time before he ever gets the call-up to the big club. Wouter Peeters is another goaltender who doesn’t have much experience on North American ice. He is currently in his first season in the USHL after playing the entirety of his career overseas. I talked about Peeters a little bit more in depth in my Blackhawks Prospects Overseas Report. Peeters is another name you won’t see in the NHL for a long time, but the main thing to note about him is his height. He stands at 6-foot-4. Do you see a common trend here? With all four goalies, they are pretty early in their development—they’re nowhere close to the NHL. Jeff Glass is a journeyman goalie who shouldn’t see NHL ice again, and J.F. Berube is a good third-string goalie or an emergency backup. Even Anton Forsberg hasn’t shown enough, in my opinion, to make the Blackhawks confident in him as a backup. If Corey Crawford’s injury does indeed end his career much sooner than it should have, the Blackhawks are going to need to make a serious effort to obtain a goalie of the future. Regardless, the string of goalies that the Blackhawks have shouldn’t make anyone overly confident, and this is a position that they need to address in the offseason. While they are going to need to draft some defensemen, especially with their first-round pick, it might be smart for them to pick up another goalie in the later rounds of the draft.